Summary: Today will be dry, tomorrow will bring some rain chances, but the best chance for rain and storms this week is Thursday. Today, we are looking at a high temperature of 94 degrees under mostly sunny skies. Humidity will be in the 60’s as we go through the day, keeping our heat index (or “feels like”) in the mid to upper 90s. While there is no official rain chance today, there could be a pop up shower that lasts for 10 minutes then goes away (this happened yesterday in our neighboring county – see below tweets). 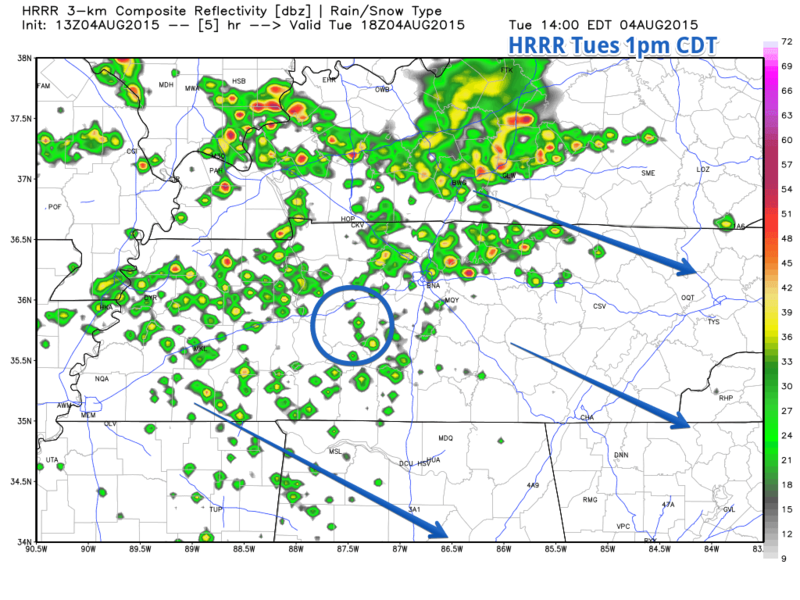 There is a front in Kentucky that will keep most if not all the rain north of us, but a tiny shower is possible. 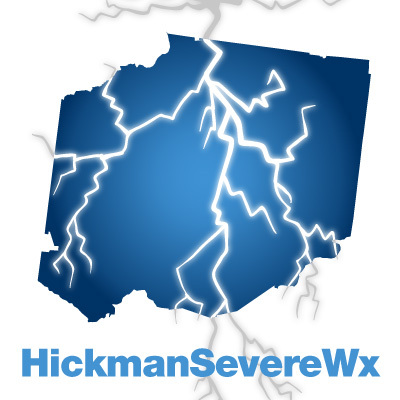 The HRRR wants to suggest that one house in Hickman County might get lucky enough to get rain, but we aren’t expecting much if anything. The other models don’t think we will see anything. In other words, don’t expect any rain today, but don’t worry, rain is coming. Tonight, our low drops to about 72 degrees under mostly cloudy skies. 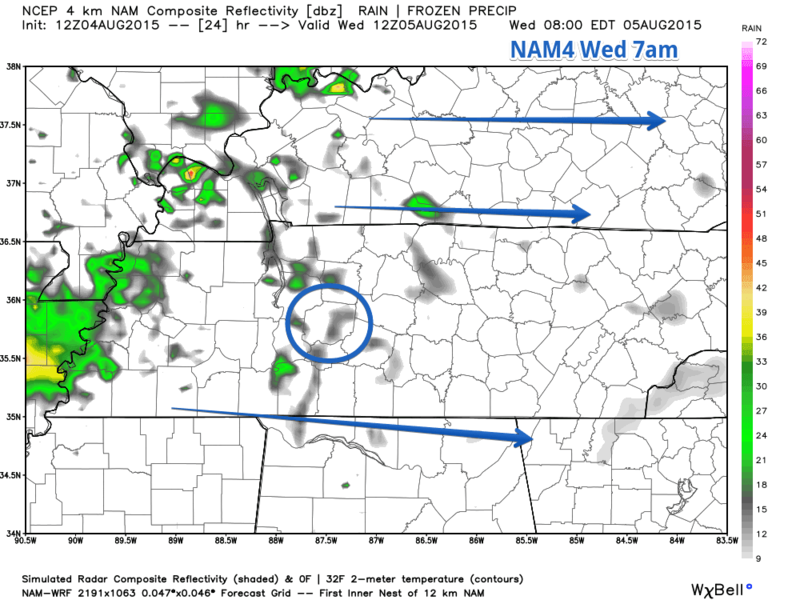 Wednesday sees a better chance of rain. For Wednesday, the temperature will reach about 89 degrees with a 40% chance of thunderstorms. It’s also going to be a bit more humid today with dew points in the 70’s. 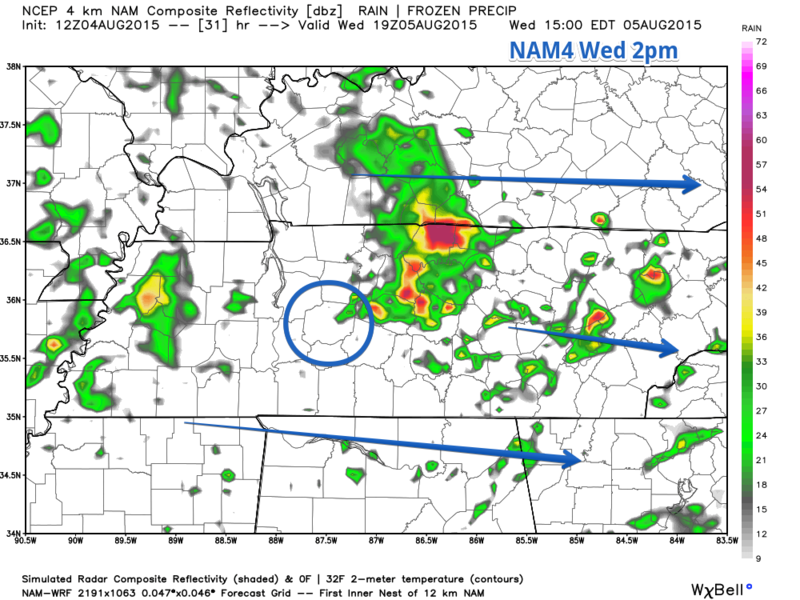 NAM4 puts a small chance of rain over us as we get ready to go to work in the morning. Rain chances increase later in the day as storms develop. Here’s NAM4’s simulated radar for 2pm. Not much right over Hickman County, but remember, these models aren’t exact in where storms will pop up (they aren’t THAT good). Wednesday’s overnight low will drop to about 70 degrees, but our rain chances go up to a 50% chance of storms overnight. Thursday is the best day for lawn-watering. If you’re really counting on the rain to help your grass and plants, then Thursday will be the day you want to bet on. Thursday’s high temperature will be about 86 degrees with a 60% chance of rain and storms. 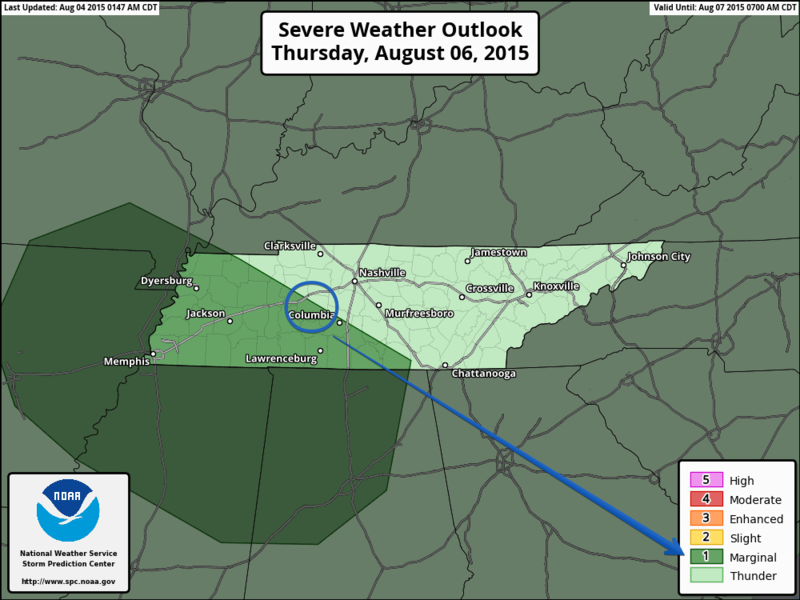 We aren’t expecting wide-spread severe weather, but storms could be strong. The Storm Prediction Center has is in a MARGINAL category for severe weather for Thursday. On a scale from 0 to 5, this puts us at a 1. Thursday night, rain chances go down to 30% as we see our temps drop to about 87 degrees overnight. Friday there will be some lingering showers, but the weekend looks to be dry. Saturday’s high will be around 88 degrees and Sunday’s high will be around 90 degrees.